Coffee With Games: FPS Friday! What Is the Wii's Most Played FPS? I have enjoyed the FPS genre since GoldenEye 007 on the Nintendo 64, and I have spent thousands of hours playing FPS games over the years. When the Nintendo Wii was released back in 2006, I was excited about the console because of the new control methods made possible in FPS games. I have played many Wii FPS games starting with Red Steel, and I have enjoyed all of them to certain extents. Now, nearly 5 years into the Wii's life-cycle the system has seen a decent number of FPS games released for it, some with local multi-player, some with online multi-player, and some just single-player. The Wii has more than twenty games I would classify in the FPS genre, but which FPS game is the Wii's most played per player? Let's take a look! How many bullet holes can you count? Call of Duty: Black Ops has had about 108,985 Wii owners report game-play data since the game released this past November. Black Ops has seen an increase of about 44,354 more gamers reporting game-play hours since March 21 this year. Call of Duty: Black Ops has 7,655,023 Total Hours of game-play reported, with an average play-time of 70 Hours 15 Minutes "Per person". The game's average play-time is just over 2 Hours 47 Minutes per day/session the game is played. Call of Duty: Black Ops' Wii Amazon.com sale rank is #236, and it is selling for $43.82. Black Ops' "professional" review score average on the Wii is 81.47%, based on 17 reviews on GameRankings.com. The game has a 4 out of 5 Stars rating on Amazon.com, based on 111 customer reviews. Black Ops' customer review score average is 78.73%, when the customer reviews are converted to a 100% review scale. Call of Duty: Black Ops was developed by Treyarch, and published by Activision. As the trailers below show, the game received a "Mature" rating from the ESRB with "Blood and Gore, Intense Violence, Strong Language" listed as content for gamers/parents to be aware of. 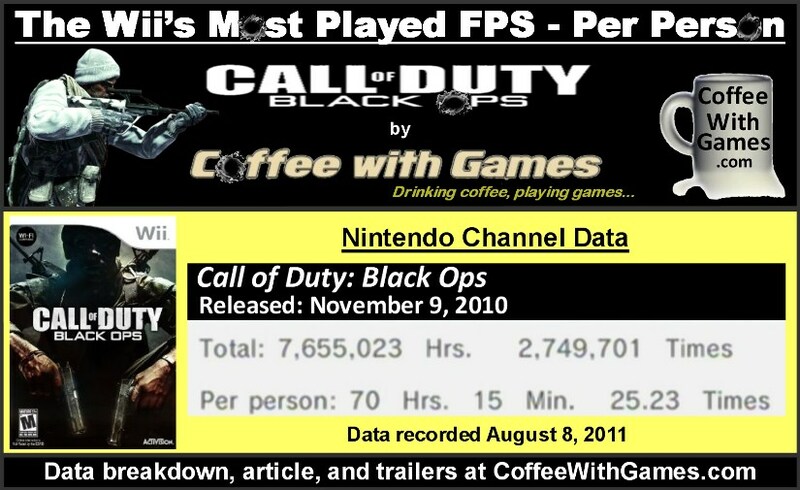 Call of Duty: Black Ops is the Wii's most played FPS game to date, "Per person". This means Wii owners that are playing Black Ops, are playing it more hours on average(70 Hours 15 Minutes) per individual, than any other Wii FPS on the system. 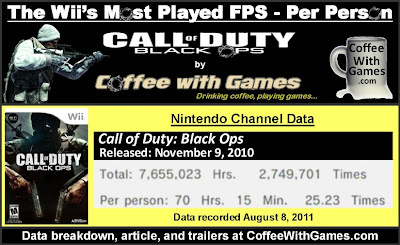 While Call of Duty: Black Ops is the Wii's most played FPS game to date, "Per person", it is not the Wii's most played FPS according to "Total Hours". Considering this data reflects just 272 days of game-play possibly reported, I think this should show developers that the Wii is a platform FPS games are enjoyed on, and that it has perhaps been overlooked by other developers/publishers when it should not have been. If any of you play Call of Duty: Black Ops on the PS3 still, feel free to add my PSN name to your list. My PSN name is Hoj_Latte, if you add me to your list, leave a comment letting me know so I can make sure to check and add your invite back! Did any of you purchase Call of Duty: Black Ops the day it released, and find yourself still playing the game? If any of you are playing the Wii version, do you know how many hours you have played the game? Without a doubt it's the best FPS on Wii. They keep improving with the overall quality of the games with each new version. Can't wait for MW3 in Nov! 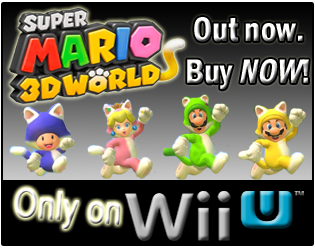 This is a genre I would expect to become better represented on the Wii U. It's become a blockbuster genre, where the releases tend to be the videogame equivilant of Michael Bay films, which also means expensive and technically impressive projects. The Wii's control system is arguably better for the genre, but the problem is, the experience is lesser. My favourite FPS this generation has been Crysis 2, and without the visuals and the density of environments, it just wouldn't be the same. The Wii could not handle it. The Wii U on the other hand... I have my fingers crossed for Nintendo's sake. I was a first-day pick up of Black Ops for the ps3 - I don't play regularly, but every once in awhile I find myself logging a few more hours here and there. I got this game the first day it was released. No doubt in my mind that this is the Best FPS on Wii by a longshot in terms of content and gameplay. I've played already 10 days worth of this game via online. This game is so underrated--especially compared to goldeneye from a critic perspective. I also can't wait for MW3 in November! Hopefully they have DLC. Half of the "gamers" (I use that term lightly) I know play it on Xbox 360 and PS3. None of them play it on the Wii. Compared to number of hours Super Smash Bros Brawl or Mario Kart Wii are played, the FPS hours are paltry. Both games I mentioned are played more than even Netflix Instant Streaming on Wii. I've skipped the last two COD Wii releases, but I may venture back to the Wii in the future with the series. I haven't played either Crysis game, but I loved Far Cry on the PC. I learned the game sandbox engine with Far Cry, and spent months creating two levels. 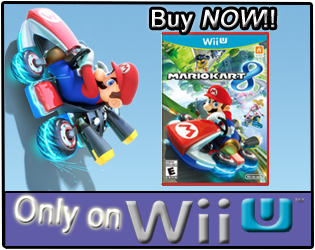 I think the one place Nintendo needs to help guarantee success with the Wii U, is online and with control standards. I really hope developers don't abandon the Wii Remote and Nunchuk in the FPS games. You know, I don't think we have ever played a night of Black Ops on the PS3 together...perhaps one or two matches, but not many. You know, I thought it's interesting Black Ops Wii hasn't gotten any DLC, as I thought it was something Treyarch was going to work on...so I wonder if it's a system issue, or just Treyarch not seeing the money to do it. "Still, I am not suprised. Will Modern Warfare 3 be the same? Who knows"
Based on all of the data for the Wii Call of Duty games with online multi-player, I would say that data will probably be the same...though I don't know if the lurking Wii U will cause some to not purchase the game on the Wii. "Compared to number of hours Super Smash Bros Brawl or Mario Kart Wii are played, the FPS hours are paltry." Not sure what you mean by "paltry", as these hours are "Per person", not "Total Hours" reported. Call of Duty: Black Ops has more hours played "Per person", than Mario Kart Wii, and it's not far behind Super Smash Bros. Brawl in the "Per person" category now. Netflix also has more hours "Per person", and I think this time next year Netflix will be passed Mario Kart Wii and probably Super Smash Bros. Brawl in "Total Hours" reported. Thank you all for the comments/feedback so far! If anybody else has any thoughts on Black Ops, feel free to share them.